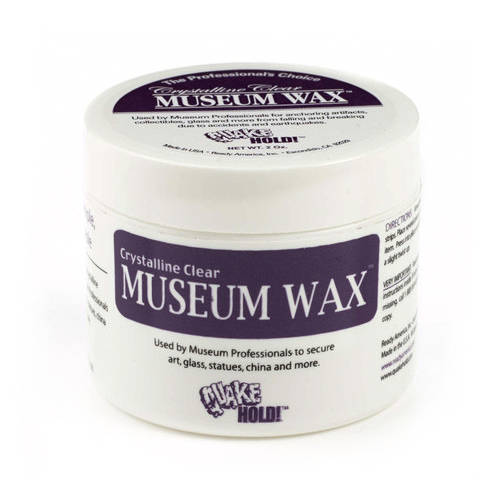 This clear Museum Wax is the same formulation museum conservators have been using for years. This microcrystalline product provides instant grip to secure collectibles, artifacts and more in the event of an earthquake or sudden knock. It is specifically designed for use on wooden surfaces because it will protect the wood, as well as securing your valuable items to it. It also performs well as a temporary “glue” to hold items in place, while being cleaned, repaired or photographed, and can be removed with mineral spirits. NOTE: This wax is used on items not moved often. Use QuakeHold for a less permanent hold. Scoop out a little museum wax from the jar and roll it into small balls. Apply it to the bottom of an object, then lightly press the object on to the surface. A 4oz jar of museum wax is enough to secure up to 200 items of average size.